When you get an invite to party exactly right after a series of exams, you just do not say no! Never mind the fact that I do not have anything new to wear. The promise of something new to drink, a.k.a Captain Morgan Original Spiced Rhum, is lure enough for me. Got word from mamang Eden (my saint for everything grandiose) that Captain Morgan, the lovable rogue that he is, will be throwing a guaranteed legendary parteeeey over at my favorite party destination, Alchology. You bet this DamnVixen was keen for an adventure! 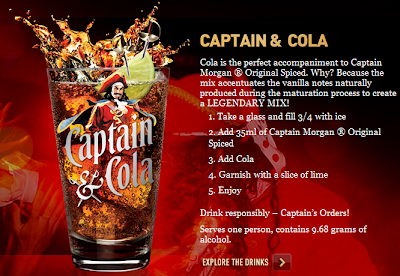 Captain Morgan has been taking over the country's "it bars" lugging along with him his prized treasure chest. Customers are given keys to this chest where inside it is a trove of premiums which await the lucky new shipmates. Oh I did get my own key alright, however I was so into the beats, sounds and dancing that I lost my loot! I say blame it on the 3 full glasses of Captain and Cola I had downed that night! The drink mixes the unique blend of Caribbean Rum, mellow spices, and flavoring, with the right amount of cola and ice—the perfect serve for all occasion, any season. Soon the notorious Captain Morgan will hijack your favorite bars and hangouts so that you can get a taste of Captain & Cola and get the chance to unlock his treasure chest for some special gear, just like how some of us in Cebu Fashion Bloggers had experienced! Holler to Rabsin, Marco, Mac, Lyka and Mark Monta for an awesome time! Me, Mac, Lyka and Captain Morgan! Don't mind my electric blue eyeshadow, just hustle over to Captain Morgan Philippines Fan Page to keep yourself up to date with the Captain’s adventures, promos, and other news. Captain Morgan is distributed by Diageo, makers of Johnnie Walker, J&B, Baileys and BenMor Four Casks Scotch Whiskey among others, and the world’s leading premium drinks business trading in more than 180 countries.